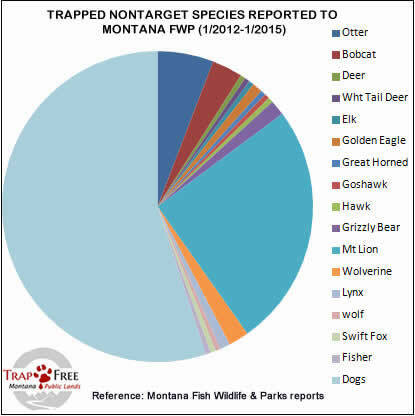 Trap alerts in Montana of reported traps and snares. Information on types of traps, signs of trapping and what to watch for, how to release pets from traps, and studies conducted on the efficiency and injuries from traps and snares. Three main types of traps. The conibear, top left. Leghold or Foothold traps, on right and center. Snare, which is a wired cable on bottom. Ambrose Saddle. We are not sure of the type of traps being used. To help try to find your missing dog, contact your regional Montana Fish Wildlife and Parks headquarters regarding trapped dogs. Hunting is strictly regulated and hunters are generally penalized for shooting the wrong species. Hunters have a season, wear orange, have a bag limit, are not allowed to bait animals. Hunters are not permitted to leave their guns set unattended ready to shoot. In Montana it is illegal to leave a fishing pole unattended. 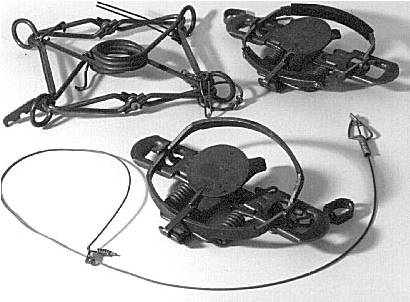 A trapper can set and leave as many traps and snares as they chose. Trappers tell FWP they set 50,000 traps. A Culver man who bragged about poaching bobcats, raccoons and a skunk on his social media accounts was recently arrested in connection with multiple hunting and trapping violations.